This Robin Hood movie is an attempt to remake the classic story of Robin Hood with the modern-day special effects and technology. The movie does a good job at being action-packed and not having much in the way of dull moments. However, the movie is over-the-top in a way where some scenes pull you out of the movie with how extreme and overdone it is. Nate Livingston described the movie as “Michael Bay’s Robin Hood”; the movie is over-edited and over-the-top in more ways than one. Even though the movie is not the best of the Robin Hood films, the acting from the cast brings this movie up a little bit. Taron Egerton, Eve Hewson and Jamie Fox are astounding in this movie. Jamie Fox, known for his role in Baby Driver and as the villain in The Amazing Spider-Man 2, plays Little John and has maybe the best character development and subplot of any other character in the entire movie. Taron Egerton, known for his work in Kingsmen and Testament of Youth, plays Robin of Locksley and does a great job in portraying such an iconic character. 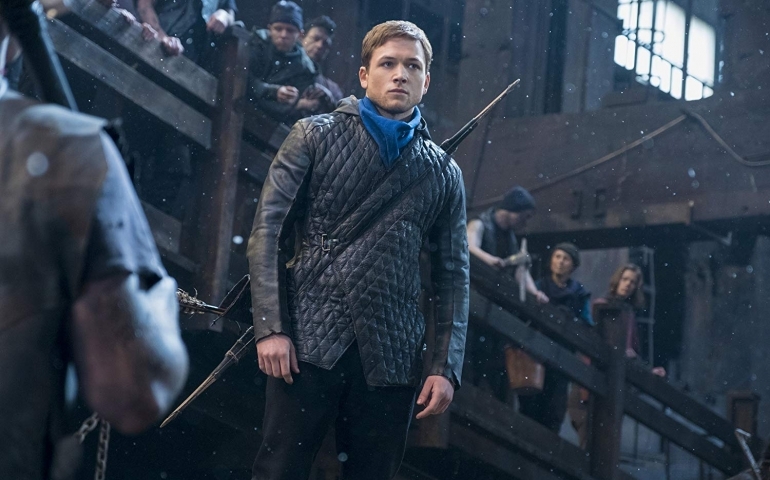 The movie may not be great for people wanting a super in-depth Robin Hood movie, but it is the kind of movie you go into and turn off your brain, watching some cool action scenes with good acting; yet, the story doesn’t delve deep into any of the characters. This movie is not the best Robin Hood movie, but it still is a movie worth watching– just maybe not until it reaches the dollar theater.